This is quite possibly the best cheesecake I have ever made. 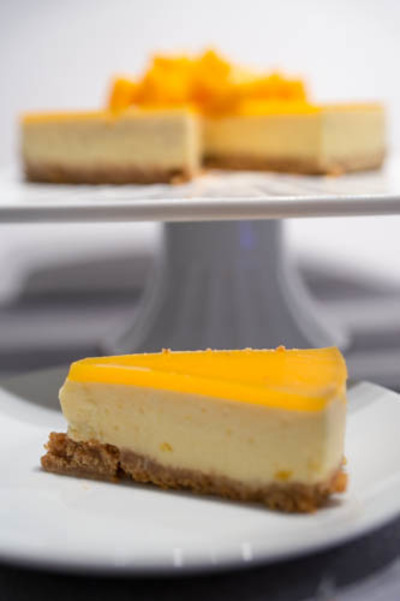 The combination of the three layers- biscuit base, creamy filling and mango topping are just amazing and it has the wonderful jelly like texture that melts in your mouth. It is best to prepare this the day before you want to serve it because it needs about 6-8 hours in the fridge to set but it is well worth it! The perfect dessert for summer. Place biscuits in food processor and blitz until finely crushed. Add melted butter and blitz again to combine. Press biscuit mixture in to base of prepared tin. Using the flat bottom of a drinking glass or the back of a spoon, flatten out the base until smooth. Put the tin in the fridge to set. Put the 10g of leaf gelatin in a bowl and submerge in water. Leave for 5 minutes to soften. In the meantime, beat the cream cheese in a mixing bowl until smooth. Add cream and sugar and continue mixing until combined. Transfer cream cheese mixture to a saucepan and place over lowest heat on element. Whisk until completely smooth. Take gelatine leaves out of water and give them a good squeeze to get rid of any excess water. Add them one by one to cream cheese mixture, whisking as you go (they will dissolve immediately). Remove from element and leave to cool for a few minutes. Add the yoghurt, lemon juice and pureed mango to cream cheese mixture and combine. Leave to cool completely. Pour on top of biscuit base in cake tin and gently smooth out. Leave to set in the fridge for about 3-4 hours. To make the top submerge the 5g of leaf gelatine in a bowl of water and leave to soften again for five minutes. Put the 150g of pureed mango, water, sugar and lemon juice in saucepan and place over low heat. Take gelatine leaves out of water, squeeze any excess out and place one at a time in mango mixture, whisking until dissolved. Remove from heat and allow to cool slightly. 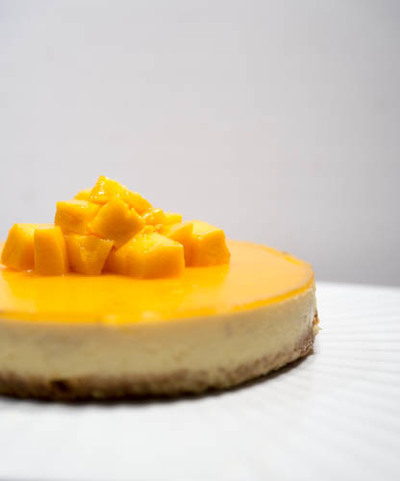 Remove set cheesecake from fridge and pour over mango topping. Tilt the tin slightly so that it covers the whole tin. Place back in the fridge to set for another 3-4 hours. Gently remove the cheesecake from the tin. You will have to run a knife around the edges to release it. 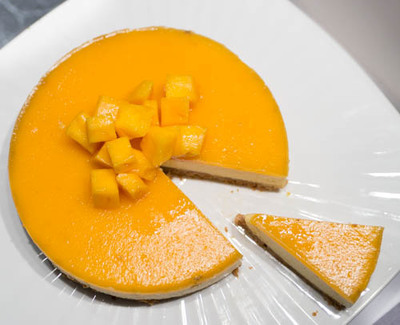 Cut the remaining mango in to squares and pile up in the middle for decoration.